Samantha (Sami) Beth Deur, age 5, of Holland left this world and entered into the loving arms of Jesus. Sami as a baby was happy all the time but was born a fighter as well, with feistiness, mischievousness, and was one part sassy, labeled “Princess Sassy Pants” by her family. She could read a person and could draw people in and make them love her. At school she was called the baby whisperer. Sami would comfort and feel other children’s emotions. At one point in her life she was told she would never walk but that didn’t stop her because Sami did walk. If upset, her mom or dad would turn on the television to the Mickey Mouse clubhouse, and her joy would return, and Sami would dance. She loved swings, bubbles, and roller coasters. 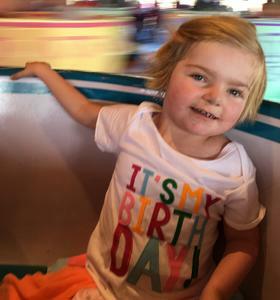 Her last birthday was spent at Disney World with her family, including “Gran Jan” and “Aunt Feather”. She loved playing with her brother Lukas and because of their different personalities she could at times drive him nuts. But through it all he was the best big brother she could ever wish for and loved him unconditionally. Big brother could make her smile like no one else. During her hours of therapy Sami could get mad but instead of stopping it would drive her to keep going. She was very determined and never felt sorry for herself. Sami fought to the very end and never gave up. They repeated over and over “Sami never gives up, Sami finds a way”. To mom, dad and brother she was their hero. She was preceded in death by Grandpa Phil Hansen and Grandma Laura Hansen. Sami is survived by her parents Kory and Heidi Deur and her brother Lukas; grandparents: Jan Hansen of Destin, FL, Ken Deur of Holland, Karen and Jim Gaitan of Holland and Paul Hansen of Madison, WI; great grandmother: Marge Burmeister of Oregon, WI; numerous aunts, uncles and cousins. A celebration of life will be 11:00 am, Friday, February 8, 2019 at First Reformed Church, 630 State Street in Holland. Rev. Dr. Daniel Gillett will be officiating. Visitation will be from 6-8 pm, Thursday, February 7, 2019 at Dykstra Funeral Home – Northwood Chapel, 295 Douglas Avenue in Holland. Memorial contributions may be given to in lieu of flowers please donate to the Ronald McDonald House of Ann Arbor www.rmhcannarbor.org.